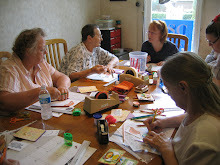 Participants in this class will focus on making various small projects that impress as they expand (unfold). They all look more complicated than they are. A great way to stock up on small gifts for the holidays. Bag Lunch (12:00-1:00) is included. Time: 9:30 a.m. - 12:30 p.m.